In the previous post we dived into Compression and Deduplication in ZFS. Here we’ll look at Deduplication in practice based on my experience. Compression almost always offers a win-win situation. The overhead of compression is contained (not storage-wide) and except where there is heavy read/modify/write, it will not have unjustified overhead. It’s only when we have heavy writes on compressed datasets that we need to benchmark and decide which compression algorithm we should use, if any. Deduplication is more demanding and a weightier decision to make. When there is no benefit from deduplication, the overhead will bring the system performance to a grinding halt. It is best to have a good idea of the data to be stored and do some research before enabling dedup by default (i.e. on the root). When the benefit from deduplication is minimal, the overhead will not only be in terms of higher memory usage, lower performance, but the DDT will be using disk space in the dozens, if not hundreds, of GBs. This means that there is a minimum dedup gain below which the overhead will simply negate the benefit, even if our hardware is powerful enough. Duplicates are between multiple users. Duplicates are between multiple datasets. Duplicates are spread over millions of small files. To see why the above make sense, let’s take a hypothetical case where we have one user and one dataset with thousands of GB-sized files. If we have duplicate files in this case, we can simply find them and hardlink duplicates. It should be clear that this will work perfectly, and it’s practical to frequently rediscover duplicates and hardlink them, except for the above four cases. That is, hardlinks don’t work across users (I’ll leave aside the issue of privacy and consider what happens when one user decides to modify a hardlinked file and inadvertently ends up modifying the other user’s version as well, since they are hardlinked,) they don’t work across datasets (i.e. filesystems) by definition (because inodes are only meaningful in a single filesystem) and hardlinking will be more complicated and a maintenance issue if our duplicate data is mostly a large number of small files. Finally, hardlinks simply means the filesystem is pointing multiple files to the same data. Modifying one will modify the other, which might not be desirable even in a single-user scenario, rather than create a new copy. ZFS dedup feature works using copy-on-write, so modifying a deduplicated block will force ZFS to copy it first before writing the modified data, thereby preserving the other previously-duplicate files to the one being modified. If after ingesting data in a dedup=on dataset we decide to remove deduplication, we will need to create another dataset with dedup=off, and copy our data over (one can also use send/receive, which are beyond the scope of this write up see below). If you are in a situation where you have dedup enabled (at least on some of the datasets) but aren’t sure whether or not performance is suffering, there are a few tools I can suggest. zpool iostat [interval [count]] works very much like iostat except it is on the ZFS-pool level. I use zpool iostat 10 to see the IOPS and bandwidth on the pool averaged at 10 second periods. Unfortunately, zpool iostat doesn’t include cache hits and misses, which are very important if we are interested in DDT thrashing. Fortunately, there is a python script (direct link) in the ZFS on Linux sources that does that. arcstat.py [interval] dumps hit and miss statistics as well as ARC size and more (the columns are customizable, but the default should be sufficient). For those interested, arcstat uses raw numbers with some fields computed on the fly directly from /proc/spl/kstat/zfs/arcstats, which can be read and parsed as one wishes. Try cat /proc/spl/kstat/zfs/arcstats for example. Of important note is the IOPS relative to the bandwidth. Specifically, if the bandwidth divided by IOPS is <128KB, it means we are reading small files, which will affect performance compared to reading large files with sequential 128KB blocks. In other words, an average 25MB/s looks poor until we take into account that it is during reading 100s of small files (<128KB each) per second. For large files the average bandwidth is typically 10x higher. ARC reads is rather high, betraying the fact that we are accessing deduplicated data. With ~15% ARC misses, we can assume that about 15% of our reads are wasted to ARC reads. Prefetching is virtually useless here (and if this were a typical usage, we should disable prefetching altogether, but for larger file reads prefetching pays dividends handsomely). Another very important thing we learn from the above numbers is the low data and metadata misses. This is extremely important, arguably more important than ARC misses and DDT thrashing, as having high metadata miss-rate will translate in far higher latency in statting files and virtually any file operation, however trivial, will also suffer significantly. For that, it’s best to make sure the metadata cache is large enough for our storage. We can see that the ARC size above is exactly at the max I set and I know from experience that the default ARC Meta limit of ~900MB gives poor performance on my data. For an 8GB RAM system, 3GB ARC size and 1.5GB ARC Meta size gives the most balanced performance across my dataset. If you already have dedup enabled at all, a very handy command that shows deduplication statistics is zdb -DD . The result is extremely useful to understand the distribution of data and DDT overhead. Here are two examples from my pool taken months apart and with very different data loads. The first two lines give us footprint information. First we get the number of entries with at least 2 references (refcnt >= 2) and the size per entry on disk and in RAM. In my case 3.96m deduplicated entries are taking 3385MB on disk and 545MB in RAM. The second line represents the same information for unique entries (entries that are not benefiting from deduplication). I had 35.2m unique entries consuming 30575MB (29.9GB) on disk and 4032MB (3.9GB) in RAM. That’s a total of 33960MB (33.2GB) on disk and 4486MB (4.4GB) in RAM in 39.2m entries, for the benefit of saving 12-13% of 5.13TB of data, or a little over 600GB. This is not that bad, but it’s not great either, considering the footprint of the DDT, the benefit of saving 12-13% comes at a high cost. Notice that compression is independent of dedup gains and so I’m not accounting for it. Although it’s nice to see the overall gains from dedup and compression combined. We’ll get to copies in a bit. The histogram shows the number of references per block size. For example, the second to last line shows that there are 16-32 thousand references to a single block that has a logical size (LSIZE) of 128KB taking 512 bytes physically (PSIZE,) implying that this is a highly compressed block in addition to being highly redundant on disk. I’m assuming DSIZE is the disk size, meaning the actual bytes used in the array, including parity and overhead, for this block. For this particular entry there are in fact 20.3 thousand references with a total logical size of 2.54GB but compressed they collectively weigh at only 10.2MB, however, they seem to be taking 162MB of actual disk real estate (which is great, considering without dedup and compression they’d consume 2.54GB + parity and overhead). Powered by this valuable information, I set out to reorganize my data. The following is the result after a partial restructuring. There is certainly more room for optimization, but let’s use this snapshot for comparison. A quick glance at the numbers and we see major differences. First and foremost the DDT contains only 12.7m entries (down from 39.2m above,) while the dedup ratio is up at 15-16% (a net gain of ~3%). Compression is way up at 13% from 3% with a slight overhead of extra copies at 1%. The extra copies showed up when I manually “dedpulicated” identical files by hard-linking them. Normally copies “are in addition to any redundancy provided by the pool, for example, mirroring or RAID-Z. The copies are stored on different disks, if possible. The space used by multiple copies is charged to the associated file and dataset, changing the used property and counting against quotas and reservations.” according to the ZFS man page, but I’m not entirely clear as why they showed when I hard linked large files and not, say, when I already had highly-redundant files which could benefit from extra redundancy in case of an unrecoverable corruption. What really counts in the above numbers is the relative effectiveness of deduplication. That is, the higher the dedup percentage, the lower the overhead of unique blocks becomes. It’s true that I reduced the number of duplicate blocks, but that’s mostly because I either deleted duplicate entries or I hardlinked them. So they weren’t really beneficial to me. Meanwhile, I reduced the number of unique entries substantially, increasing the utility of deduplication. This means the overhead, which is now far lower than it used to be, is being utilized better than before. This gives me an overall net gain that could be quantified by the dedup * compress / copies formula, which went from 16% to 29%, which is almost double. I still have more work to do in optimizing my data and deduplicated datasets. Ideally, we should only have dedup enabled on datasets that either gain at least 20% from deduplication (although some would put that number far higher) or the unique blocks are potential duplicate entries pending future ingestion. Unique data that is deemed to remain unique has no place in deduplicated datasets and should be moved into a separate dataset with dedup=off. Similarly, duplicate that that is best manually deduplicated by hardlinks, or duplicates deleted, should be done so to reduce undue overhead and waste. Once we decide that a dataset is not benefiting from deduplication (typically by finding duplicates across the full zpool or by doing other statistical analyses,) we can set dedup=off on the dataset. However this will not remove blocks from the DDT until and unless they are re-written. A fast and easy method is to use send and receive commands. First, we need to either rename the dataset or create a new one with a different name (and rename after we destroy the first). #Rename old dataset out of the way. #Take a recursive snapshot which is necessary for zfs send. #Now let's create the new dataset without dedup. #And let's copy our data in its new home, which will not be included in the DDT. #Remove the snapshot from the new dataset. #Validate by comparing the data to be identical between data and data_old. #After validating everything, destroy the source. The end result of the above is to remove a dataset form the DDT. Note that a -F on recv will force it, which will not fail if data has some data! This is useful if we need to start all over after moving some data into the new dataset. There is a -d and -e options, which are useful for recreating the tree structure of the source. These are typically needed when datasets move between pools. To see the target tree with a dry run, add -nv to recv. Note that the target dataset will be locked during the receive and will show empty using ls. The output of send can be redirected to a file or piped into gzip for backup. Hope you found this helpful. Feel free to share your thoughts and experience in the comments. In the previous post we looked at performance and benchmark statistics on a home NAS/HTPC with ZFS on Linux. Here we’ll take a deeper dive into some of the more interesting features of ZFS–Compression and Deduplication. When I set out to build a NAS I aimed for the lowest cost with the best utility. My primary goal was to move all my precious (and the less-than-rare) files in a redundant storage that is accessible, manageable and low-cost, but reliable. The idea of extending it to HTPC came to me after comparing prices of commercial home/small-biz NAS solutions with the cost of the bare components. One can do so much more with a generic Linux box than a specialized black-box. However I wasn’t willing to pay a premium to turn what started out as NAS into a general purpose rig; It had to be low-profile. ZFS offers enterprise-level features and performance at the cost of maintaining it. Never underestimate the overhead of maintenance though. The biggest issue I’ve had to face with ZFS on Linux was that of memory starvation. I had read that ZFS has less than humble memory requirements and it could always put more of it to good use. Recommendations of 1-2GB / TB of storage floats on the web. However I ended up supplying it with only 8GB for 18TB of storage to be shared with the OS and other applications. The experience is worth sharing, especially the lessons learnt, which should prove worthwhile for others with similar plans to mine. But first, we need to take a look at some of the internals of ZFS. Both compression and deduplication are designed to reduce disk space usage as much as possible. One should keep in mind that these features don’t come for free and there are caveat to be aware about. First and most important point to keep in mind before deciding which features to enable is that deduplication happens on the zpool level. The pool is at the volume management layer and dedup works on the block-level, away from any file structures. The filesystem dataset sits atop the zpool and that’s where compression works, before deduplication is done. When enabled, zfs compresses each block using the chosen compression algorithm and writes to the pool. While writing, the zpool compares the checksum of the incoming block with existing block checksums, and, if a match is found, the matching block’s reference count is incremented, the block reference ID passed back to the filesystem and no data is written to disk (expect the reference count increment in the deduplication table). Neither dedup nor compression work retroactively. So a change in either setting will not propagate to existing data. When new data is written, or old data read/modified/written, the new settings will take effect. Due to the fact that compressed block data depends on the compression algorithm (and level,) identical blocks compressed with different compression algorithms virtually certainly will not match as identical (although their uncompressed bytes match). This is only an issue when the pool has identical duplicate data in different datasets with different compression algorithms or level. Datasets that have similar data that can benefit from deduplication will lose that opportunity if they utilize different compression settings. Changing the compression setting of a dataset should be done when one is fairly confident that the gains will outdo any loss of dedup opportunities with other datasets with a different compression setting. The overhead of compression is very much contained and bounded in that the hit is taken for each block at the time of reading and writing to that block and that block alone. Compression will require no extra disk space beyond the compressed file bytes and the memory overhead is typically negligible and of fixed size (because the block size is also fixed). Do note that a block will be written uncompressed if after compression there is no saving of at least 12.5% (1/8th) of the block size. That is, for a 128KB block, if compression doesn’t save at least 16KB, the block will be written uncompressed. Future reads will not have any decompression overhead of course, but re-writing said block will go through the same compression cycle to decide whether or not to write the compressed version. Notice that the compression algorithm and level is stored with each block, so changing these values on the dataset does not affect existing data, but only apply to future modify and writes. Naturally when a block is written uncompressed the metadata of the block will mark it as uncompressed. This means that having uncompressible media files on a compressed dataset will only incur the overhead of compressing at ingestion time and, in virtually all cases, the uncompressed data will be written to disk, and no overhead when reading (I read the code to be sure). Where compression could make a net gain of 12.5% or more, those blocks will be written compressed and it’d only be fair to pay the penalty of decompression for them and them alone when reading. By default, lz4 compression could be used, unless we know we will store incompressible data, such as already compressed video or audio files, that will not be write-once read-many (WORM). If files will be modified heavily, we have to make a very educated decisions (read: experiment/research before you commit). While for highly compressible data (such as source code, databases, XML dumps etc.) gzip will do much better than lz4, it will also have a much higher CPU cost, and for those who care about it, latency. On the other hand, if you use gzip, it wouldn’t matter much whether you use gzip-1 or gzip-9 (relatively speaking to lz4, that is). My preference is to default to gzip-7 for the root of the pool and either choose no compression (very rarely) or choose gzip-9 for all WORM data. Unlike compression, Deduplication has to keep track of all blocks in the pool (that belong to datasets with dedup=on). The number of blocks will be at least as large as the number of files, in the rare case that each file is less than or equal to a single block size. In practice, the number of blocks will be orders of magnitude larger that the number of files. Each block will therefore have both a disk, memory and cpu overheads. All three resources will increase the more the blocks we have. On disk the dedup tables (DDT) are stored to survive reboots, which are loaded to memory to maximize the performance of finding matches when writing files, which will require more processing the more the block checksums there are to compare against. Of the three the most worrisome is the memory overhead. On disk a few extra gigabytes will not be noticeable and searching even trillions of checksums should take microseconds at worse. It’s the memory needed to hold said trillions of checksums to perform fast comparisons is the problem. It is recommended to have 1-2 GB of RAM per TB of disk for good performance. Interestingly, the more duplicate blocks in the pool, the smaller the memory requirement per entry will be. This is because the DDT stores the unique block checksums that are written to disk, which is less than or equal to the total number of blocks. So a pool that doesn’t benefit from deduplication will be wasting more resources than one that is benefiting handsomely. As such, if we do not expect a significant gain from deduplication, the overhead will not be justified and should be avoided by disabling it. Deduplication works on the block level. It computes a checksum per block and looks up the checksums in a deduplication table (DDT) to find duplicates. The default checksum is sha256. Although sha256 is a cryptographic hash (meaning it’s designed to have great avalanche characteristics and be exceedingly difficult to synthesis,) there is still a negligible chance that two different data blocks might hash to the same value. For the paranoid, ZFS dedup supports verification by byte comparison when checksums match and before assuming the blocks to be identical (and discarding one for the other). However, and as dedup author Jeff Bonwick has pointed out, the chance that sha256 will have a collision is less than that of an undetected ECC memory error, although the actual error rate by chance is far higher than he calculates due to the birthday paradox. Because this miscalculation is parroted elsewhere, it might be worthwhile to point out why it’s wrong. The verify option is useful when used with a less secure checksum function that is much faster but will produce more collisions on average. As I’ve written in the first part of this series, Fletcher4, which has a much smaller size, is no longer enabled for deduplication purposes. And in any case using a shorter hash (such as Fletcher4) is not recommended. Unless you know what you’re doing, using weak hash functions without verify will sooner rather than later have collisions and so will corrupt your data (hence the need for verify with weak hashing). The problem with verify on weak hash functions is that you’ll have a higher number of bit-for-bit comparisons when the hashes collide. The gains of a faster hashing function vs the higher verify comparisons will probably be counter productive, or at least will diminish the performance advantage that fletcher4 and the like offers. Personally, I’d stick with sha256+verify for deduplication and use gzip-7 or higher for compression by default. For uncompressible data with high write or modify operations I would disable compression and deduplication (unless one knows that the compressed data could be deduplicated, it most probably won’t). For highly compressible data with high write or modify operations (i.e databases or virtual machine images,) lz4 should prove a winner. In the next part we will look at practical usage of compression and deduplication with analysis. 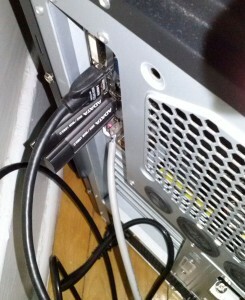 In the previous post I wrote about the software layer in a home NAS/HTPC with ZFS on Linux. Here we’ll take a look at the performance of the system. 6x 3TB WD REDs in case and connected (cables on opposite side). I had planned to run performance tests at different stages of data ingestion. Features such as compression and deduplication are bound to have some impact on performance. Even without these features, I wasn’t sure what to expect from my hardware and RaidZ either, especially that I didn’t exactly aim for the top level hardware. I don’t even have a decent boot drive; just two cheap flash drives. The only components that I didn’t get cheapest possible were the drives (WD green or Toshiba would have been significantly cheaper). While the performance of the hardware is mostly independent of data, ZFS is a filesystem and its performance depended on the number of files, blocks, and total data size for a given hardware. 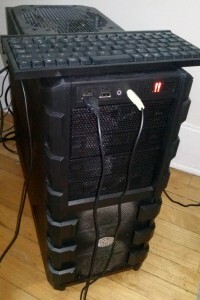 Two ADATA flash drives were used to create a Raid-0 (12GB) and Raid-1 (10GB) drives. These are raw read and write performance directly to the drives without filesystem overhead. At 24% capacity with 2.88TiB of data in 23 million block, 7% dups. RAM is 8GB. The data size is important in evaluating deduplication performance in light of the available RAM. As previously noted, ZFS requires copious amount of RAM even without deduplication. When deduplication is enabled, performance deteriorates rapidly when RAM is not sufficient. My performance tests confirm this as you’ll see below. All tests were run without any cpu-intensive tasks running or any I/O (beyond that of the network activity by SSH). The files I chose were compressed video files that gzip couldn’t compress any further. This exercised the worst-case scenario of gzip in terms of performance when writing. 365MB/s of sustained read over 13GB is solid performance from the 5400 rpm Reds. Not bad, with all the overhead and cache misses, managed to do 251MB/s over 1.5GB. 4.1GB/s is the peak for my RAM/CPU/Bus and ZFS overhead. I couldn’t exceed it, but I can do much worse with smaller bs values (anything lower than 128KB, which is the ZFS block size, will trash the performance, even when fully reading from RAM). ~360MB/s seems to be the real disk+ZFS peak read bandwidth. Poor performance with disk-to-disk copying. I was expecting better performance, even though the heads have to go back and forth between reading and writing which trashes the performance. More tests to find out what’s going on. Notice the file is not compressible, but I’m compressing with gzip-9 and dedup is on, and this is decidedly a dup file! Now, to find out a breakdown of overheads. Before every test I primed the cache by reading the file to make sure I get >4GB/s read and remove read overhead. Very poor performance from dedup! I thought compression+reading were the killers, looks like dedup is not very swift after all. Now that’s something else… Bravo AMD and ZFS! 270MB/s gzip-9 performance on incompressible data including ZFS writing! Faster write speeds than reading!! At least once compression and dedup are off. Why couldn’t reading hit quite the same mark? The impact that compression and deduplication have are undeniable. Compression doesn’t nearly have such a big impact and as others have pointed out, once you move from LZ4 to GZip, you might as well use GZip-9. That seems to be wise indeed. Unless one has heavy writing (or worse, read/modify/write,) in which case LZ4 is the wiser choice. Deduplication has a very heavy hand and it’s not an easy bargain. One must be very careful with the type of data they deal with before enabling it nilly-willy. ZFS needs to refer to the deduplication table (DDT) whenever it writes/updates/deletes to a deduplicated dataset. The DDT can use 320 bytes per block for every block in a dedup enabled dataset. This can add up quite rapidly, especially with small files and unique files that will never benefit form deduplication. ARC is the adaptive cache that ZFS uses for its data. The size is preconfigured to be a certain percentage of the available RAM. In addition to the ARC there is a Metadata cache, which hold the file metadata necessary for stating and enumerating the filesystem. Here I run performance tests with different ARC sizes to see its impact on the performance. First, let’s see how many blocks we have in the DDT. We have 7.05TiB of raw data comprising 43% of the disk space. The DDT contains about 31.5M unique blocks and 3.75M duplicated blocks (blocks with at least 2 references each.) The zfs_arc_max controls the maximum size of the ARC. I’ve seen ZFS exceed this limit on a number of occasions. Conversely, when changing this value, ZFS might not react immediately, whether by shrinking or enlarging it. I suspect there is a more complicated formula to splitting the available RAM between the ARC, ARC Meta and the file cache. This brings me to the ARC Meta, controlled by zfs_arc_meta_limit, which at first I thought was not important. The default for ARC max on my 8GB system is 3.5GB and ARC Meta limit is about 900MB. ARC Meta is useful when we traverse folders and need quick stats. ARC, on the other hand, is when we need block dedup info or to update one. In the following benchmark I’m only modifying ARC max size and leaving ARC Meta on the default. # sh -c "echo 5368709120 > /sys/module/zfs/parameters/zfs_arc_max"
sh -c "echo 'options zfs zfs_arc_max=5368709120' >> /etc/modprobe.d/zfs.conf"
Before every run of Bonnie++ I set the max ARC size accordingly. I used Bonnie to Google Chart to generate these charts. Find the full raw output from Bonnie++ below for more data-points if interested. The zpool sustained raw read and write speeds are in excess of 350 MB/s. Reading reached 365MB/s while writing 385MB/s. Cached-reads exceeded 4GB/s, which is fantastic, considering the low-end hardware. I should note here that the CPU isn’t overclocked and RAM is at 1600Mhz, not its rated 1866Mhz or higher. It’s 9-10-9cl, not exactly the fastest, but very decent. Compression is very fast, even on incompressible data and when gzip, unlike lz4, doesn’t short-circuit and bail on incompressible data. Deduplication overhead, on the other hand, is unbelievable! The write dropped well below 20MB/s, which is dismal. I suspect this is what happens when you have barely enough RAM for DDT (dedup table) and file cache. I must have forced some DDT reads from disk, which must be painfully slow. I strongly suspect this was the case, as when I rm-ed the 13GB file from dedup-enabled folder it took over 10minutes. This must be to find and remove dedup entries, or, in this case, to decrement the ref-count, as the file was cloned from the array. Now I really wish I got 16GB RAM. The bigger surprise than dedup sluggishness is how fast disk-to-disk copy is. Considering that reads are around 360MB/s, I wasn’t expecting an exact halving with read and write on at the same time. But we got a solid 180MB/s read/write speed. It’s as if ZFS is so good with caching and cache-writes that the head seek overhead is well amortized. Notice this was on 13GB file, which is significantly larger than total RAM, so caching isn’t trivial here. Buy more RAM (I’m limited to 16GB in 2 DIMMs). Overall, I’m happy with the performance, considering my use case doesn’t include heavy writing or copying. Dedup and compression are known to have tradeoffs and you pay for them during writes. Compression doesn’t nearly impact writes as much as one cold suspect. Perhaps with generous RAM thrown at ZFS dedup performance could be on par with compression, if not better (technically, it’s a hashtable lookup, must be better, at least on paper). Still, solid performance overall, coming from a $300 hardware and 5400 rpm rust-spinner disks. …but, as experience shows, that’s not the last word. There is more to learn about ZFS and its dark alleys. 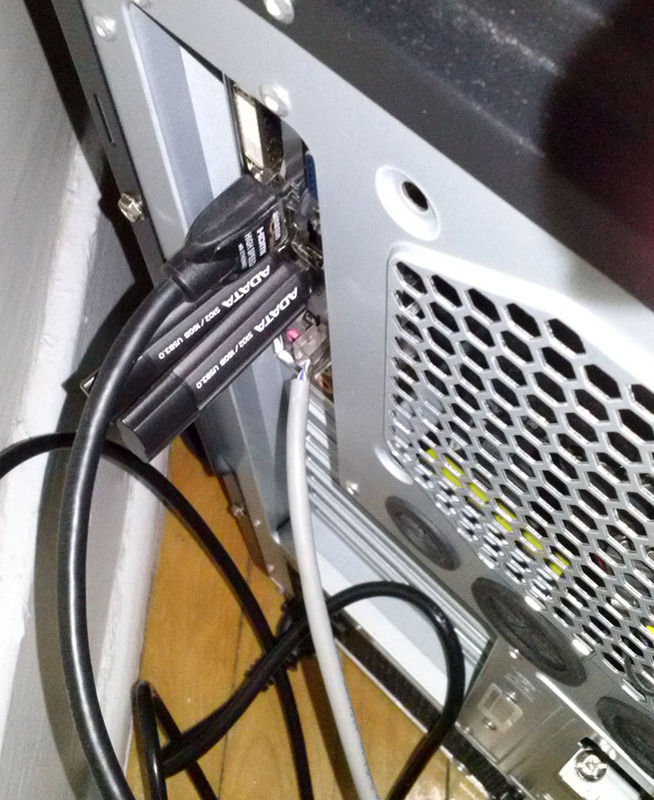 In the previous post I wrote about building home NAS/HTPC with ZFS on Linux. Here I’d like to talk a bit about ZFS as a RAID manager and filesystem. ZFS was originally developed for Solaris, by then Sun Microsystems. It has since been ported to Linux in two flavors: FUSE and native kernel module. Unlike the latter, the former run in userland and, owing to being in user-space, has a rather flexible configuration (in terms of setting it up and running it) than kernel modules. I have had an interesting run with custom kernel modules when I upgraded Ubuntu, which broke my zpool, that I’ll get to in a bit. I haven’t tried running ZFS with FUSE, but I’d expect it to have lower complexity. For the best performance and highest integration, I went with native kernel support. Of the biggest issues with kernel modules is the question of stability. One certainly doesn’t want an unstable kernel module. Doubly so if it manages our valuable data. However the ZFS on Linux project is very stable and mature. In the earlier days there were no ZFS boot loaders, so the boot drive couldn’t run ZFS. Grub2 already supports ZFS (provided ZFS module is installed correctly and loaded before it,) but I had no need for it. FUSE would do away with all of these dependencies, but I suspected it also means ZFS on boot drive wouldn’t be trivial either, if at all possible. As explained in the previous post, I used a two flash drives in RAID-1 with ext4 for the boot drive. However, soon after having ran the system for a couple of weeks, and filled it with most of my data, I “moved” /usr, /home and /var to the zpool. This reduces the load on the flash drives and potentially increases the performance. I say “potentially” because a good flash drive could be faster than spinning disks (at least for I/O throughput and for small files) and the fact that it doesn’t share the same disk (especially spindle disks) makes for higher parallel I/O throughput. But I was more concerned about the lifetime of the flash drives and the integrity of the data than anything. Notice that /var is heavily written to, mostly in the form of logs, while /usr and /home are very static (unless one does exceptionally high I/O in their home folder,) and it’s mostly reads. I left /bin and /lib on the flash drive along with /boot. Insert the USB flash drives (both bootable and target boot) and start the PC, from the bios make sure it boots from the bootable flash drive. From the Ubuntu setup choose the Expert Command-Line option and follow the steps until partitioning the drive. Create two primary Raid partitions on each drive, identical in size on both flash drives. One will be used for Swap and the other RootFS. The latter must be marked as bootable. Create software Raid-0 for one pair of the partitions and set it for Swap. Create software Raid-1 for the other pair of the partitions and format it with ext4 (or your prefered FS,) set the mount to be / and options ‘noatime’. Allow degraded boot and resliver with a script. Otherwise, booting fails with a black screen that is very unhelpful. Remove the bootable USB flash drive and reboot the machine into the Raid bootable USB we just created. Optional: Update the kernel by downloading the deb files into a temp folder and executing sudo dpkg -i *.deb. See http://www.upubuntu.com/2013/09/installupgrade-to-linux-kernel-311.html for ready script and commands. An optional mountpoint may be specified using -m switch. Example: -m /mnt/data. The default mountpoint is the pool name in the root. In my case /tank. Outside the box with the compact format keyboard and the 2x 120mm fans blowing on the drives visible. First, I chose to have a swap drive mostly to avoid problems down the road. I didn’t know what software might one day need some extra virtual memory and didn’t want the system to be limited by RAM. Speaking of RAM, I was rather short on it and would absolutely have loved to have a good 16GB. Sadly, prices have been soaring for the past couple of years and they haven’t stopped yet. I had to do with 8GB. Also, my motherboard is limited to 16GB (a choice based on my budget). So when push comes to shove, I can’t go beyond 16GB. I also had sufficient boot disk space, so wasn’t worried that I’d ran out. Of course the swap drive is raid-0 as performance is always critical when already swapping and there are no data integrity concerns (a corruption will probably take down the process in question, but that’d threat the boot drive as well). Raid-1 is used for the boot partition, which is a mirror, meaning I had two copies of my boot data. Second, alignment is extremely important for both flash drives and large-format drives (a.k.a. 4096-byte sectors). Flash drives comes from factory formatted with the correct alignment. There is no need to repartition or reformat the drives, unless we need to change the filesystem or have special needs. However if we must, the trick is to create the partition at an offset of 2048 sectors (or a megabyte). This ensures that even if the internal logical block (which is the smallest unit used by the flash firmware to write data) is as large as 1024KB, it will still be correctly aligned. Notice that logical units of 512KB are not uncommon. ZFS will do the right thing if we create the pool on the root of the drive and not partitions; it will create a correctly aligned partition. I manually created partitions beforehand mostly because I wanted to see whether or not the drives were native large-format or it was emulating. However we absolutely must mark the block size to be 4096 when creating the pool, otherwise ZFS might not detect the correct sector size. Indeed, for my WD RED drives, the native sector size is advertised as 512! Marking the block size is done by ‘ashift’ and it’s given in powers of two; for 4096 ‘ashift’ is set to 12. Third, it is crucial to create the pool using disk IDs and not their dynamically assigned names (eg. sda, hdb, etc.). The IDs will not change as they are static, but the assigned names almost certainly will and that will cause headache. I had to deal with this problem (more later) even though, and as you can see in the command above, I had used the disk IDs when creating my zpool. Notice that using the disk ID will also save you from the common mistake of create the zpool using the partitions of the disk, rather than the root of disk (the IDs are unique to the disks but the partition and disk have each its own assigned name). I’ll fast forward to discuss a particular problem I faced that is a valuable lesson. After upgrading from Ubuntu raring (13.04) to saucy (13.10) the pool showed up as UNAVAILABLE. After the initial shock had passed I started trying to understand what had happened. Without having an idea of what the issue is, it’s near impossible to solve it. UNAVAILABLE, as scary it looks at you, doesn’t say much as to why the system couldn’t find it. status: One or more devices could not be used because the label is missing or invalid. There are insufficient replicas for the pool to continue functioning. action: Destroy and re-create the pool from a backup source. First thing I did was a reality check; sure enough my home was on the boot (flash) drive. Good thing it wasn’t very outdated since I had moved /usr, /home and /var to the zpool. I was glad the machine booted and I had essentially everything I needed to troubleshoot. The link in the zpool output above turned out to be less than useful. Clearly what happened was related to the upgrade. That was my biggest hint as to what triggered it. This wasn’t helpful in googling, but I had to keep it in mind. At this point I was already disappointed that the upgrade wasn’t seamless. I listed the devices and started looking for clues. I had created the pool using the device IDs, which are unique and never change from system to system. So my expectation was that it wasn’t a drive mapping issue. Alas, it was precisely a problem of drive mapping. The reason turned out to be that the “scsi” IDs that I’ve used to create the pool were now no longer listed under /dev/disk/by-id/. Instead, there were only the “ata” IDs. At the time of creating the pool I had both “scsi” and “ata” IDs. I chose the former for one reason or another. Turns out that the “scsi” names were removed from the /dev/disk/by-id/ listing. The solution turned out to be rather simple, finding it was anything but. By exporting and importing the pool the new IDs were detected and the pool reconstructed. After exporting, zpool status would complain that there were no pools. During importing, zfs detected the drives and mapped them correctly. At this point I was happy again, but for a short while. Turns out I wasn’t done yet. The three root directories I had moved to the zpool were not mounting anymore. I could forcefully mount them (with great difficulty as every time it’d complain it couldn’t mount,) only to find the directories were the original ones on the boot drive and not the zpool versions. The way it was supposed to work was by mounting the zpool directory to the same mountpoint as the boot drive ones, they masked the latter. After a rather long chase, and many reboots to see if my changes stuck or not, I found out that the process responsible for mounting is mountall. However ZFS has its own custom build, which apparently got reverted with the upgrade. Clearly I’m using an old mountall version. How about zfs? Good: there is a saucy version. Bad: Ubuntu upgrade didn’t get it automatically. I suspect this has to do with the fact that I had used the raring package URL. Still, one expects a bit better upgrade support when it comes to kernel modules that can lock one out of the machine. And reinstalled ZFS to force removing the current version for the newer one. 1 upgraded, 0 newly installed, 0 to remove and 348 not upgraded. Need to get 1,728 B of archives. Rebooting was all I needed from this point on and all was finally upgraded and fully functional. I have recently built a home NAS / HTPC rig. Here is my experience from research, building it, and experimentation, for the interested in building a similar solution or to improve upon it… or just for the curious. I ended up including more details and writing longer than I first planned, but I guess you can skip over the familiar parts. I’d certainly have appreciated reading a similar review or write up while shopping and researching. 6x 3TB WD RED drives cut from the same stock. Purpose: RAID array with >= 8TiB usable space, to double as media server. Cost: Minimum with highest data-security. Performance requirements: Low write loads (backups, downloads, camera dumps etc. ), many reads >= 100mbps with 2-3 clients. TL;DR: ZFS on Linux, powered by AMD A8 APU, 2x4GB RAM and 2x16GB flash drive in Raid-1 boot drive, backed by 6x3TB WD Red in Raidz2 (Raid-6 equivalent) for under $1400 inc. tax + shipping. The setup was the cheapest that met or exceeded my goals and is very stable and performing. AMD’s APUs are very powerful for ZFS and transcoding video, RAM is sufficient for this array size and flash drives are more than adequate for booting purposes (with the caveat of low reliability in the long-run). ZFS is a very stable and powerful FS with advanced and modern features at the cost of learning to self-serve. The build gives 10.7TiB of usable space with double-parity and transparent compression and deduplication, with ample power to transcode video, at a TCO of under $125 / TiB (~2x raw disk cost). Reads/Writes are sustained above 350MB/s with gzip-9 but without deduplication. This is significantly cheaper than ready NAS solutions, even when ignoring all the advantages of ZFS and generic Linux running on a modern quad core APU (compare with Atom or Celeron that often plague home NAS solution). The largest cost of a NAS are the drives. Unless one wants to spend an arm and a leg on h/w raid cards, that is. Regardless, the drives were my first decision point. Raid-5 gives 1 disk redundancy, but due to high resilver time (rebuilding a degraded array) chances of secondary failure increase substantially during the days and sometimes weeks that resilvering takes. Drive failures aren’t random or independent occurrences, as drives from the same batch, used in the same array, tend to have very similar wear and failure reasons. As such, Raid-5 was not good enough for my purposes (high data-security). Raid-6 gives 2 drive redundancy, but requires a minimum of 5 drives to make it worthwhile. 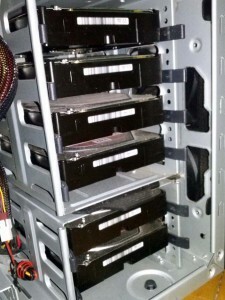 With 4 drives, 2 used for parity, Raid-6 is about as good as a mirror. Mirrors however have the disadvantage of being susceptible to failure if the 2 drives that fail happen to be the same on both sides of the mirror. Raid-6 is immune to this, but IO performance is significantly poorer than mirroring. Resilver time could be reduced significantly with true h/w raid cards. However they cost upwards of $300 for the cheapest and realistically $600-700 for the better ones. In addition, most give peak performance with backup battery, which costs more and will need some maintenance I expect. At this point I started comparing h/w with s/w performance. My personal experience with software data processing told me that a machine that isn’t under high-load, or is dedicated for storage, should do at least as good as, if not better than, the raid card’s on-board processor. After all, the cheapest CPUs are much more powerful, have ample fast cache and with system RAM that is in the GBs running at least at 1333 Mhz, they should beat h/w raid easily. The main advantage of h/w raid is that, with the backup battery, it can flush cached data to disk even on power failure. But this assumes that the drives still have power! For a storage box, everything is powered from the same source. So the same UPS that will keep the drives spinning will also keep the CPU and RAM pumping data long enough to flush the cache to disk. (This is true provided no new data is being written when on battery power.) The trouble with software raid is that there is no abstraction of the disks to the OS, so it’s much harder to maintain (the admin will maintain the raid in software). Also, resilvering with h/w will probably be lighter on the system as the card will handle the IO without affecting the rest of the system. But, I was to accept the performance penalty I was probably going to meet my goals even during resilvering. So I decided to go with software Raid. The best software solutions were the following: Linux Raid using MD, BtrFS or ZFS. The first is limited to traditional Raid-5 and Raid-6 and is straightforward to use, is bootable and well-supported, but it lacks any modern features like deduplication, compression, encryption or snapshots. BtrFS and ZFS have these features, but are more complicated to administer. Also, BtrFS is still not production-ready, unlike ZFS. So ZFS it was. Great feedback online on ZFS too. One important note on software raid is that they don’t play well with h/w raid cards. So if there is a raid controller between the drives and the system, it should be set to bypass the devices or work in JBOD mode. I’ll have more to say on ZFS in subsequent posts. 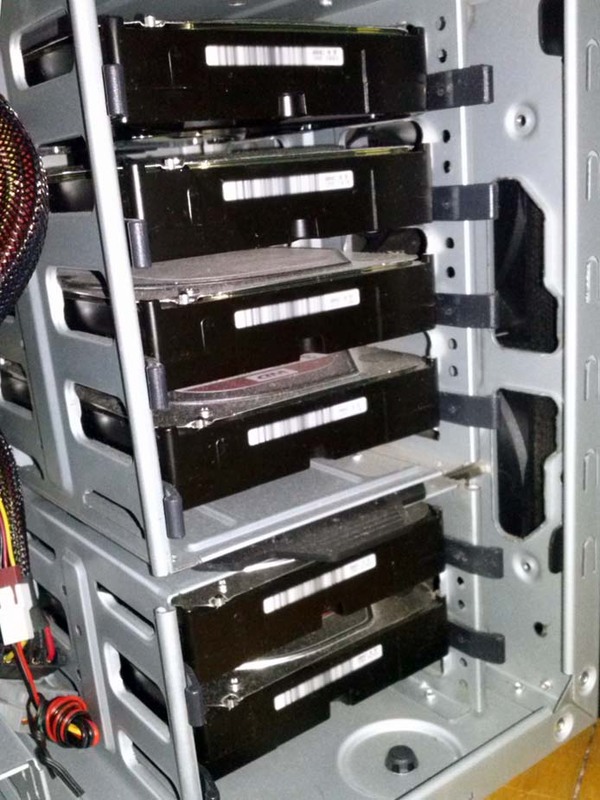 To reach 8TiB with 2 drive redundancy I had to either go with 4x4TB drives or 5x3TB. But with ZFS (RaidZ) growing the array is impossible. The only solutions are to either add larger drives (one at a time and resilver until all have larger capacity and then the new space becomes available to the pool,) or, to create a new vdev with a new set of drives and extend the pool. While simply adding a 6th drive to the 5 existing would have been a sweet deal, when the time comes I could upgrade all drives with larger one and enjoy new drive longevity and extra disk space. 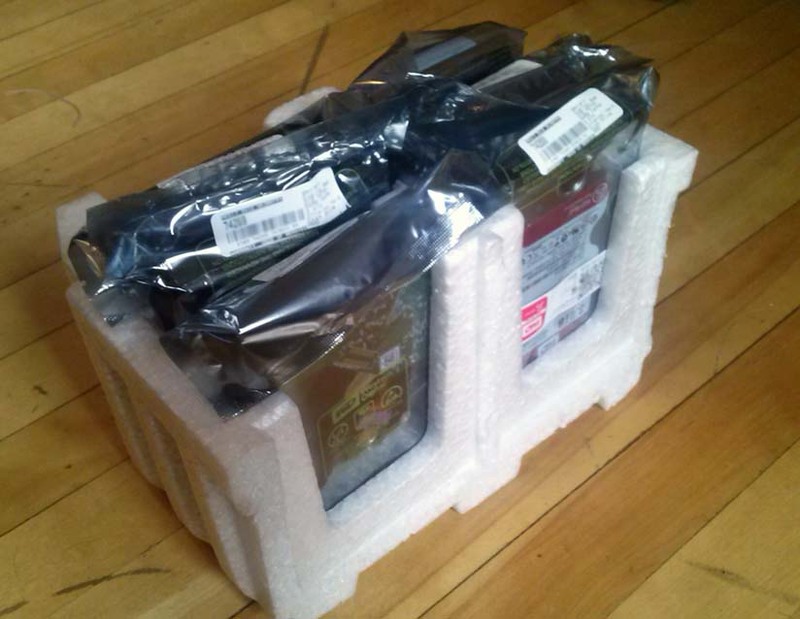 But first I had to have some headroom, so it was either 5x4TB = 12TB or 6x3TB=12TB. Which drives? The storage market is still recovering from the Thailand flood. Prices are coming down, but they are still not great. The cheapest 3TB are very affordable, but they are 7200 rpm. Heat, noise and power bill are all high with 6 drives in an enclosure. They also come with 1 year warranty! Greens are cool and low on power requirements, but they are more expensive. The warranty isn’t much better, if at all longer. WD Red drives cost ~$20 more than the greens, come with all the advantages of 5400 rpm drive, are designed for 24/7 operation and have 3 year warranty. The only disadvantage of 5400 rpm drives is lower IOPS. But 7200 rpm doesn’t make a night-and-day difference anyway. Considering that it’s more likely than not that more than 1 drive will fail during 3 years, the $20 premium is a warranty purchase if not for the advantage of NAS drive vs. home usage. There was no 4 TB Red to consider at the time (Seagate and WD have “SE” 4TB drives that cost substantially more), although the cost per GB would be the same, it was outside my budget (~$800 for the drives) and I didn’t have immediate use for 16TB space of usable to justify the extra cost. AMD’s APU with its tiny heatsink and 2x 4GB DIMMs. Noticeable is the absence of a GPU (which is on the CPU chip). I wanted to buy the cheapest hardware I could buy to do the job. I needed no monitor, just an enclosure with motherboard, ram and cpu. 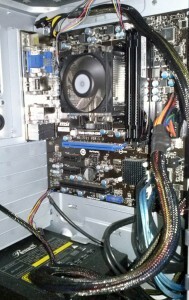 The PSU had to be solid to supply clean, stable power to the 6 drives. Rosewill’s Capstone is one of the best on the market at a very good price. The 450W version delivers continuous 450W power, not peak (which is probably in the ~600W range). I only needed ~260W continuous plus headroom for initial spin up. The case had to be big enough for the 6 drives + front fans for keeping the already cool-running drives even cooler (drive temperature is very important for data integrity and drive longevity). Motherboards with > 6 SATA ports are fewer and typically cost significantly more than with 6 or less. With 6 drives in raid, I was missing a boot drive. I searched high and low for a PCI-e SSD, but it seems there was nothing on offer for a good price, not even used ones (even the smallest ones were very expensive). Best price was for WD Blue 250GB (platter) for ~$40, but that was precious port that it would take, or cost me more in motherboard with 7 SATA ports. My solution was to use a flash drive. They are SSD and they come in all sizes and at all prices. I got two A-DATA 16GB drives for $16 each, thinking I’d keep the second one for personal use. It was after I placed the order that I thought I should RAID-1 the two drives to get better reliability. With ZFS, RAM is a must, especially for deduplication (if desired). It is recommended to have 1-2GB for each TB of storage. So far, I see ~145 bytes / block used on core (RAM) which for ~1.3TiB of user data in 10million blocks = 1382MB of RAM. Those 10million blocks were used by <50K files (yes, mostly documentaries and movies at this point). The per-block requirement goes down with increased duplicate blocks, so it’s important to know how much duplication there are in those 1.3TiB. In this particular case, almost none (there were <70K duplicate bocks in those 10million). So if this was all the data I had, I should disable dedup and save myself RAM and processing time. But I still have ~5TiB of data to load with all of my backups, which sure have a metric ton of dups in them. Bottom line: 1GB of ram per 1TiB of data is a good rule of thumb, but it looks like it’s a worse-case scenario here (and that would leave little room for file caching). So I’m happy to report that my 8GB ram will do OK all the way to 8TiB of user data and realistically much more as I certainly have duplicates (yes, had to go for 8GB as budget and RAM price hike of 40-45% this year alone didn’t help. Had downwards price trends continued from last year, I should have gotten 16GB for almost the same dough). Updates on RAM and performance below. CPU wise, nothing could beat AMD APU, which includes Radeon GPU, in terms of price/performance ratio. I could either go for dual core at $65 or quad core for $100 and upgrade L2 cache from 1MB to 4MB and better GPU core. I went for the latter to future proof video decoding and transcoding and give ZFS ample cycles for compression, checksum, hashing and deduplication. The GPU in the CPU also loves high-clock RAM. After shopping for a good pair of RAMs that work in dual-pump @ 1600Mhz, I found 1866Mhz ones for $5 more that is reported to clock to over 2000Mhz. So G.Skill wins the day yet again for me as is the case on my bigger machine with 4x8GB @ 1866 G.Skill. I should add that my first choice in both cases had been Corsair as I’ve been a fan for over a decade. But at least on my big build they failed me as they weren’t really quad-pump (certainly not at the reported frequency and G.Skill has overclocked to 2040Mhz from 1866Mhz while the CPU is at 4.6Ghz, but that the big boy, not this NAS/HTPC). I got the drives for $150 each and the PC cost me about $350. Two 16GB USB3.0 flash drives are partitioned for swap and rootfs. Swap is on Raid-0, ext4 on Raid-1. Even though I can boot off of ZFS, I didn’t want to install the system on the raid array, in case I need to recover it. It also simplifies things. The flash drives are for booting, really. /home, /usr, and /var should go on ZFS. I can backup everything to other machines and all I’d need is to dd the flash drive image onto a spare one to boot that machine in case of a catastrophic OS failure. Also, I keep a Linux Rescue disk on another flash drive at hand at all times. The rescue disk automatically detects MD partitions and will load mdadm and let me resilver a broken mirror. One good note is to set mdadm to boot in degraded mode and rebuild or send an email to get your attention. You probably don’t want to go in with a rescue disk and a blank screen to resilver the boot raid. The 6 Red drives run very quietly and are just warmer than the case metal (when ambient is ~22C), enough that they don’t feel metallic-cold at sustained writing thanks to two 120mm fans blowing on them. Besides that, no other fans are used. AMD comes with an unassuming little cooler that is less loud than my 5 year old laptop. A-Data in raid gives upwards of 80MB of sustained reads (average over full drive dd read) and drop to ~19MB of sustained write speed. Bursts can reach 280MB/s and writes a little over 100MB/s. Ubuntu Minimal 13.04 was used (which comes with Kernel 3.8) and kernel upgraded to 3.11, ZFS 28 (the latest available for Linux, Solaris is at 32, which has transparent encryption) installed and 16.2TiB of raw disk space reported after Raidz-2 zpool creation and 10.7TiB of usable space (excluding parity). The system boots faster than the monitor (a Philips 32” TV) turns on (that is to say in a few seconds). The box is connected with a Cat-5 to the router, which has a static IP assigned to it (just for my sanity). I experimented with ZFS for over a day just to learn to navigate it while reading on it before scratching the pool for the final build. Most info online are out of date (from 2009 when deduplication was all the rage in FS circles) so care must be taken when reading about ZFS. Checking out the code, building and browsing it certainly helps. For example, online articles will tell you Fletcher4 is the default checksum (it is not) and that one should use it if they want to improve dedup performance (instead of the much slower sha256), but the code will reveal that deduplication is defaulted and forced to sha256 checksum and that is the default even for on-disk checksums for integrity checks. Therefore, switching to Fletcher4 will only increase the risk of on-disk integrity checking, without affecting deduplication at all (Fletcher4 was removed from the dedup code when a severe bug was found due to endianness). The speed should only be worse with Fletcher4 if dedup is enabled because now both checksums must be done (without dedup Fletcher4 should improve the performance at the cost of data security as Fletcher4 is known to have a much higher collision rate than sha256). 2x 16GB flash drives in RAID-1 as boot drive and HDMI connection. UPDATE: Since I wrote the above, it’s been 3 days. I now have over 2TiB of data ingested (I started fresh after the first 1.3TiB). The drives sustain at a very stable ~6000KB/s writes and anywhere between 200 and 500 IOPS (depending on how sequential they are). Typically it’s ~400 IOPS and ~5800KB/s. This translates into ~125GiB/hour (about 85GiB/hour of user data ingestion), including parity and FS overhead. Even though with gzip-9 and highly compressible data the rate or writing goes down, I now am writing from 4 threads and the drives are saturated at the aforementioned rates. So at this point I’m fairly confident the bottleneck of ingestion are the drives. Still, 85GiB/hour is decent for the price tag. I haven’t done any explicit performance tests because that was never in my goals. I’m curious to see the raw read/write performance, but this isn’t a raw Raid setup, so the filesystem overhead is always in the equation and that will be very much variable as data fills up and dedup tables grow. So the numbers wouldn’t be representative. Still, I do plan to do some tests when I ingest my data and have a real-life system with actual data. Regarding compression, high-compression settings affect only performance. If the data is not compressible, the original data is stored as-is and no penalty for reading it is inured (I read the code,) nor is there extra overhead in storage (incompressible data typically grows a bit when compressed). So for archival purposes the penalty is slower ingestion speed. Unless modification will happen, slow and good compression is a good compromise as it does yield a few % points compression even on mp3 and jpg files. With Plex Media Server installed on Linux, I could stream full HD movies over WiFi (thanks to my Asus dual-band router) transparently while ingesting data. Haven’t tried heavy transcoding (say HD to iphone) nor have I installed windows manager on Linux (AMD APUs show up in forums with Linux driver issues, but that’s mostly old and for 3D games etc.) Regarding the overhead of dedup, I can disable dedup per filesystem and remove the overhead for folders that don’t benefit anyway. So it’s very important to design the hierarchy correctly and have filesystems around file types. Worst case scenario: upgrade to 16GB RAM, which is the limit for this motherboard (I didn’t feel the need to pay an upfront premium for a 32GB max MB). I haven’t planned a UPS. Some are religious about availability and avoiding hard power cuts. I’m more concerned about the environmental impact of batteries than anything else. ZFS is very resilient to hard reboots, not least thanks to its journaling and data checksums and background scrubbing (validating checksums and rebuilding transparently). I had two hard recycles that recovered transparently. I also know ztest which is a dev test tool does all sorts of crazy corruptions and kills and it’s reported that in 1million tests no corruptions were found.